In 1977 at the Age of seventeen I accepted the Lord as my personal Savior in the Pentecostal Church of God, under the Ministry of Rev Errol T Sampson in Wait-A-Bit Trelawny, Jamaica West Indies. Soon after conversion I was baptized with the Holy Ghost and was deeply motivated towards ministry and serving others even as a young believer. As a young man I felt the call to ministry; It was quite apparent to my pastor as well as godly leaders within the church, that the hand of the Lord was heavily on my life and within the very same year of my conversion I began to serve as youth Leader and Sunday school teacher. In 1981, I became a student of the Word at the Caribbean Pentecostal College in Mizpah Manchester. The training I received at CPC, helped shaped my life and better prepared me for a lifetime of Spirit-filled ministry. In my very first year at Bible College I served as a student pastor at the Redbank Pentecostal Church of God in St Elizabeth, Jamaica. I graduated from CPC in 1984 and was promoted to a licensed minister and continued to serve at Red Bank as Senior Pastor for two years. I was then transferred to the Penantwood Pentecostal Church in MayPen Clarendon, where I also served as Senior Pastor. I migrated to the USA In 1987. I began to fellowship with Trinity Faith Pentecostal Church with Senior Pastor Rev Curtis Peart. I was appointed Assistant Pastor in 1987. An intense passion for the Word led me to New Covenant Christian College Queenstown Maryland where In 1995 I completed my Bachelor of Christian Ministry. In 2002 I also completed a Master of Theology Degree with School of Bible Theology Seminary, of San Jacinto California. I served the Pentecostal Church of God as a licensed Minister in Jamaica as well as in the USA for fifteen years and in 1999 I was promoted to an ordained Minister with the Capital District of the Pentecostal Church of God, International Headquarter in Bedford Texas. I am currently still serving as Assistant Pastor of TFPCOG, the District Sectional Presbyter of the Capital District, and also the Director of Christian Education of the District. 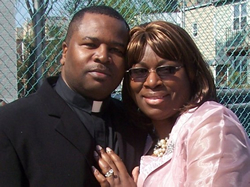 God has blessed me with a wonderful Wife and Companion Unella, as well as two wonderful Children Adrian and Junelle. We have been Married for twenty seven years. I continue to have a passion for the souls of lost humanity and for the edification of the body of Christ, I have been privilege to minister and preach the word all over the United State of America as well as in the United Kingdom.